Villa Baronessa is a majestic period home, set lavishly within its estate surrounded by rural, idyllic Sicily. Villa Baronessa is a majestic period home, set lavishly within its estate surrounded by rural, idyllic Sicily. This charming eighteenth-century manor has been restored with stylish verve and original charm, within unparalleled tranquillity. The exterior showcases the traditional country home, with original stonework and elegant cloistered veranda, with views across the Sicilian hills and Etna. This sumptuous home accommodates twelve guests across six bedrooms and six bathrooms. The interiors are impeccably tasteful, offering opulent touches and traditional features within refined and well-proportioned spaces. The bedrooms are finished with ornate character, sympathetic to the original architecture, along with the best quality fittings. Ochre tones, soft mustards and warm burnt orange provide a home-like glow; furnishings are solid timber, antiques and offset by artefacts and ornate ornaments, oil paintings and a nod to the local history. From the writer's nook, resplendent with the leather-clad chair and the antique desk with sublime views, to the ornately wrought iron railings and cloistered roof deck, this home is unapologetically gracious with its baroque flair. Suave upholstery with beautiful accents of lemon tones and crimson, pale pistachio coloured wooden shutters and beautiful Victorian furniture and vibrant touches such as salmon-toned chaise longue offer this abundant home character. The farmhouse style kitchen is a delight, offering locally hand-painted tiles and exposed brickwork; whether it be relaxed breakfasts or more formal evening meals on the polished walnut dining table, this home has ample options for colourful, vibrant group meals within a truly original Sicilian manor! The gardens at Villa Baronessa are sublime: acres of sedate, manicured lawns framed by verdant overgrowth and mysterious woods, tropical palm trees, dappled shaded paths and glistening private pool. Set across a series of layers, this refined home has equally elegant gardens to reflect its natural stylishness. The pool area is a secluded haven, offering a terrace and luscious lawns as well as shady corners, and boasts a wooden porch complete with barbecue and fridge. Guests may enjoy a refreshing morning swim followed by a continental style breakfast on the patio. Whether it be a group pool party followed by drinks or a more intimate one-to-one on one of the balcony courtyards, this home provides tasteful outdoor living in stylish tranquillity. Villa Baronessa is a unique home offering natural and historically preserved interiors, along with every comfort and Baroque style, in a stunningly secluded location just moments from the local amenities and coast. 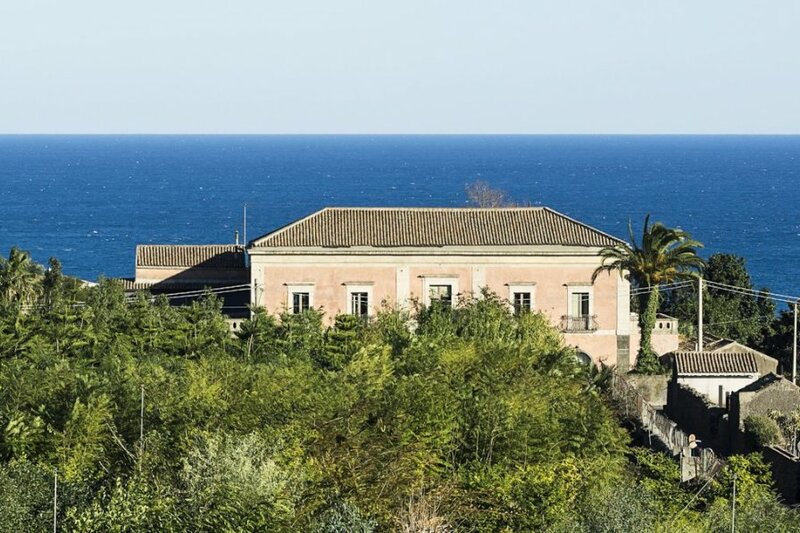 Villa Baronessa is nestled on Sicily's east coast, just a kilometre from the sea, between Taormina and Catania, providing breath-taking views over Mount Etna and the Ionian Sea. Set within the Eastern part of the island, Villa Baronessa is in the foothills of the world famous Mount Etna - the oldest recorded active volcano in the world. Nestled just outside the ancient port city of Catania (which is where the nearest airport is), this home is just moments from the beaches. Catania is dripping with history and cultural interest; the wide central square, Piazza del Duomo, features the whimsical Fontana dell'Elefante statue and richly decorated Catania Cathedral. Taormina is a stylish and well-heeled town, offering pretty cobbled streets and upscale boutiques, drawing a smart international crowd and some excellent eateries.